Last Resort is ABC’s newest epic drama which submerges the viewer in a tense standoff between the White House and a rogue submarine led by Captain Marcus Chaplin (Andre Braugher). With an all-star cast and helmed by creator Shawn Ryan (The Shield) and screenwriter Karl Gajdusek (Trespas), only time will tell if this show will be the new Lost or have viewers tuning in as a last resort. 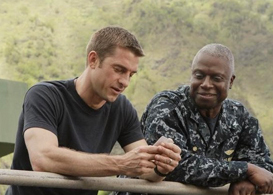 Emmy winner Andre Braugher (Homicide) plays Marcus Chaplin, the captain of a rogue navy sub, and Scott Speedman (of Felicity fame) is his executive officer. In the first episode, Chaplin refuses a shaky order to nuke Pakistan, evades a subsequent attack by his own countrymen, and then takes over an island in French Polynesia… all while being relieved by his second in command Kendall for refusing to follow the original orders to attack. After subsequently taking back his sub, Chaplin threatens America and the rest of the world with his boat’s arsenal of 17 nuclear warheads if they don’t ‘leave him alone’. This is done after first purposely firing on his own country with a missle that detinates in the ocean near Washington D.C.- a warning shot just to prove his point. Chaplin then tells the ‘president’ of the island that he is now in charge, all while another group of patriots (which have just been saved by the sub) are threatening a revolt on board the ship. Not to mention, back on land, the wives of the crew members have been told that their husbands are dead, only to have one of them get a phone call from her husband revealing that they are alive and safe…for now! If all this seems a bit confusing, it is! It is a messy situation where the stakes, power players, and rules are constantly changing . This constant shifting and contrasting conflicts doesn’t suggest a clear picture of how the story will be told each week. One has to wonder how this fragile situation can be maintained for the entire season in order for this show to be a success. Will I be tuning in next week to see where this show takes us? Yes, but I’m hoping plotlines will be more organized and the vision clearer as the season unfolds. Only time will tell if this epic will be ABC’s next hit like Lost or a flash in the pan like Flash Forward. Last Resort airs at 8PM on ABC.